Exporting Used Vehicles to Mexico Used pick-ups and vehicles can be exported to Mexico through the Santa Teresa Port of Entry only. While pick-ups can be exported to the interior of Mexico, a variety of other types of vehicles can be exported to the border zone area in Mexico. The following information will help clarify the various requirements and procedures necessary to export vehicles to Mexico. Minimum of 8 years old. Weigh less than 7054 lbs (3200 Kgs.). The vehicle must have a gasoline engine. Bought in either The United States or Canada. The vehicle cannot have any devices that allow it to transport commercial or oversized loads. Original title and 2 copies (front & back) of title with indication of the vehicle value. Mexican customs broker and Aduana Mexico (Mexican customs) - Voters registration card, Consulate Issued ID or Mexican Passport. Shippers Export Declaration (SED) - Obtained from a US customs broker if value of used vehicle exceeds US$2,500. Pedimento - Obtained from a Mexican customs broker. The customs broker will charge you the following fees and taxes to obtain a pedimento. Obtain a date stamping from the U.S. CBP export vehicle inspection station on title or certified copies 3 days (72 hours) before exporting the used vehicle. Two copies of your identification are required. Obtain the Shippers Export Document (if applicable) from a U.S. customs broker and pedimento from a Mexican customs broker. After the 72-hour period expires, proceed to export the vehicle through the Santa Teresa port of entry. Vehicles will be subject to inspection by U.S. CBP prior to being exported. Present stamped title, copies of title, Shippers Export Document if applicable, and pedimento. If the vehicle is taken into Mexico before the 3-day (72 hours) period expires the owner will be subject to a US$500 fine or vehicle seizure. The vehicle must be a minimum of 5 years old. The vehicle may not have a value greater than US$12,000. Van or station wagon passenger limits may not exceed 10. The vehicle must be equipped with a catalytic converter. Either a registered voter's license with a utility bill (telephone, rent receipt, electricity) or a U.S. Passport, or a Visa, or a Migration form granted by the Mexican Secretariat of Government. Shippers Export Declaration (SED) - Obtained from a US customs broker if value of pick-up truck used vehicle exceeds US$2,500. Obtain a date stamping from the U.S. CBP export vehicle inspection station on title or certified copies 3 days (72 hours) before exporting the vehicle. Two copies of your identification are required. 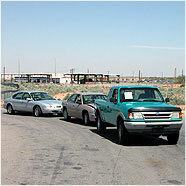 After the 72-hour period expires proceed to export the vehicle through the Santa Teresa port of entry. Vehicles will be subject to inspection by U.S. CBP prior to being exported. Present stamped title, copies of title, Shippers Export Document if applicable, and pedimento.